What’s involved in the typical MMD download project? 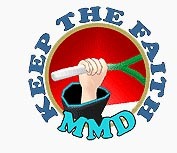 Is it easy to download an MMD animation project? My camera VMD doesn’t work right with my models. My new VMD motion file makes my model’s arms pass through her body! … needed a few tweaks and a little extra creativity, here and there… and was plenty of fun to make! MikuMikuDance is fun to play with. One of the easiest things you can DO with it is an MMD download project… just find some nice motion/music links… download ’em… open MMD, load a model, load those VMD files… and enjoy! A friend sent me a link to a download of this “Lucky” animation. The download included motion files for the Camera and two models (a male and a female)… and it included the WAV for the song. The Original video by ureshiiiiii is here… she asked that I NOT share the download link, but she may share it with you if you ask her for it. I about always do these LearnMMD projects using the models that come with the original MMD download. 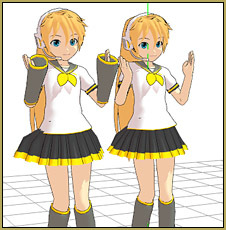 I tried to use the Animasa Len and Rin… and found that this motion data needed more complicated models. Those Animasa models are really pretty basic! I chose a nice Rin/Len duo named Rinto (the boy) and Lenka (the girl) that I downloaded from madelinemaryann on Deviant Art. The link to the Password for that download is on that page, too! They’re cute… they make a cute couple… cross-gender?… I didn’t ask! … but the boy, Rinto, is wearing those hair adornments usually associated with Rin… … ? “:o). 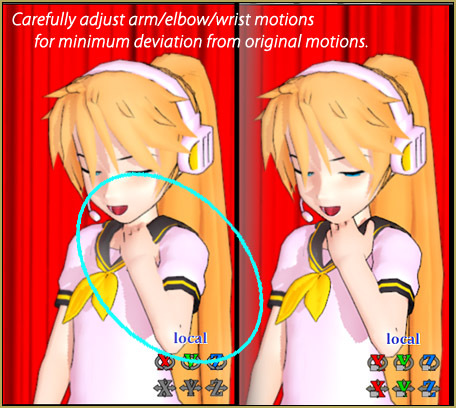 SLEEVES… most of the original MMD cast has large floppy control-panel sleeves… and they are often in the way of your downloaded motion actions! I usually work on the sleeve’s bones to move them up the arm, away from the wrist, until they do not interfere with the wrist motions… or I modify the wrist motions so as to clear the sleeves… but for Lenka, one of her Facial Slider-morphs is “Sleeveless”… Awesome! About this time I started to wonder about YouTube’s copyright issues… would Lucky get “removed”? I did what I always do, these days: a quick search on YouTube. I searched for MMD LUCKY and YouTube showed me MANY MMD Lucky videos… so I figure “They are all there… what’s one more gonna hurt?” … and, sure enough, when I was all done and posted, YouTube marked as “matched copyrighted content”… but not a problem. different colors of drapes that let you change the color away from that bright red… but, since I was using the yellow/white/black Rinto and Lenka models, I felt that the bright red was an OK background color. When I use that Auditorium Stage, I set the Background to Black… so that white light is not seen below the curtains! 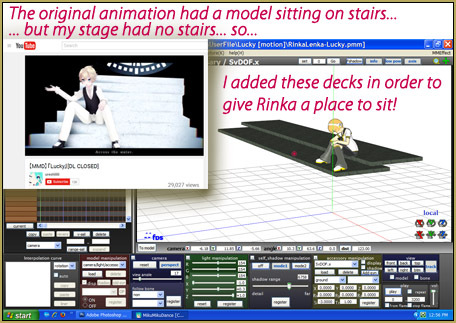 The original video and motion files had the boy sitting on a stage with a flight of steps. My stage had no steps… so I used what I call the DeckPanel (that you can download from the LearnMMD.com Downloads page) and I simply made them float in space at the right altitude to fit Rinto’s feet and “seat”. So… Rinto had been floating in the air… but now he had a seat… and now that SEAT was floating in the air! 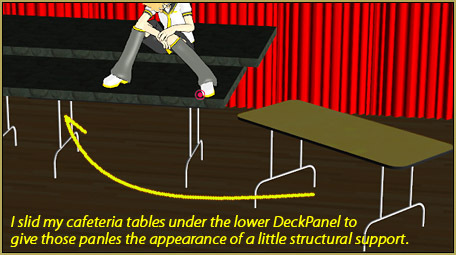 … so I slid some Cafeteria Table models (find them on the LearnMMD.com Downloads page) under those DeckPanels to give them some support. I adjusted the Si size of those tables to “fit perfect” between the stage-floor and the DeckPanels. I noticed that with Rinto sitting on those accessory steps, his MMD Ground Shadow was still on the floor; not on the DeckPanel… so I turned off Ground Shadows… and I found that I didn’t miss ’em. Almost ANY MMD download project you try-out will not “look perfect” when you push play. Like people, every MMD model is an individual… each a little different from every other. So… don’t be surprised when you see fingertips or entire hands sink into the model’s chest at some point! Just fix it… scroll through the animation, frame by frame, looking for space/time infractions… analyze the motion to find the most simple “fix”… often rotating an elbow or adjusting a wrist-rotation will get the job done. If more is needed… Go for it!… It’s YOUR version of the animation, after all… but, usually, I am careful to preserve the original motion as much as possible. My Lenka and Rinto models are not as tall as the models for which the camera motion was created… so most camera position diamonds “aim too high” for my little guys; cutting off their faces, and such. In my MMD download projects, I select the Camera bone in the bone chart and then skip along to each diamond… and adjust each of those hard points to “look right”… usually just “aiming down a little bit” for this animation. My Auditorium Stage has a ceiling on it which can block an “overhead, looking down on your models” camera shot… so, if you use the Auditorium Stage for Lucky, you will need to edit the camera motion for that scene. That stage also has drapes, left and right… and a few scenes had the camera on the wrong side of that curtain… just move the camera forward through the drape. To get my opening shot… a scene looking in from the back of the theater, I had to tilt-back that Theater Seat model so that the back rows sink into the floor. With the seats “where they belong”, flat on the floor, I just couldn’t make that view look correct… so I rolled that model on the Blue Z axis until it “looked right”. It’d look weird if you were in that Theater with the seats sinking into the floor! … but in my animation you only see the top of that “Seats” model. that adjustment and registered that light setting, and then I copied that diamond, deleted it from that spot, and pasted it into Frame Zero so as to have the lighting the same, throughout the animation. Then… I scrolled through the entire animation looking for places where the lighting needed to be readjusted so as to best light the model’s faces. 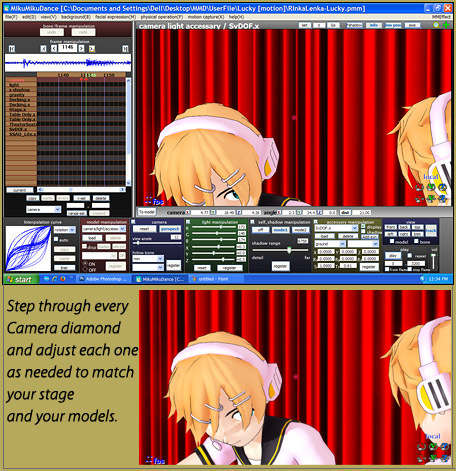 Remember that, like bone motions, MMD will smoothly move from one lighting position to the next one… so if you don’t want the lights to be shifting on their own during your scene, copy and paste the lighting diamonds to keep them in place as needed. How about adding some MME effects? With an MMD animation, there’s always “more that you can do.”… and one of the final steps is adding Effects. In my “Lucky” animation I added SSAO_Lite to enrich/deepen the colors of the model and stage. And I added SvDOF, adjusting the Si factor for each camera move, so as to focus upon the models and leave those curtains in soft-focus as often as possible. Again, I skip through the camera’s diamonds and adjust the SvDOF at each stop.